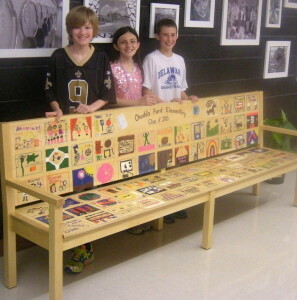 Fifth-graders Michael Walter-Dillon (from left), Katelyn Kurkewicz, and Peter Kucharczuk show off their memory-layered gift to the school. An effort to heed a tradition turned into a creative bench press for fifth-graders at Chadds Ford Elementary. Eager to continue the longstanding practice of leaving a memento at the school for future students to enjoy, the Class of 2013 marshaled some deep-seated energies into running a small business that sold Chadds Ford Elementary School (CFES) stickers. They plastered news of the sticker sales from classroom presentations to scripts for the student-run CFE TV to home flyers delivered through backpack express, said Mary Walter, the project coordinator. Stickers were also sold at school events, where partisan crowds were eager to support the cause. After filling orders and counting the proceeds, the 66 fifth-graders ended up with more than $500, said Walter. 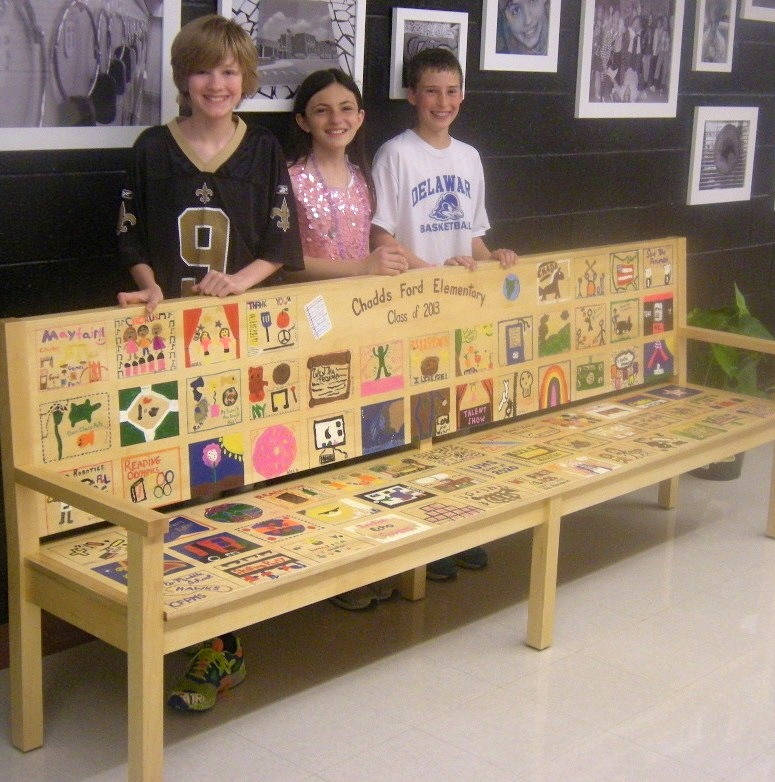 A $300 donation from the PTO enabled them to purchase a hand-crafted bench from Chadds Ford artisan Johnathan Bard, initiating the artistic phase of the project. Under the tutelage of art teacher Susan Smith and a committee of mothers, the fifth-grade students all sketched a favorite memory from their six years at the elementary school – drawing from activities, academic subjects, special events, and field trips. Each student got a 6-by-5-inch spot on the bench to express their personal remembrance, Walter said. She said it took about six weeks for the preparation of the bench (sanding, coating, and taping the grid for the individual spaces), for all the students to paint their artwork – which required sacrificing some recess time – and for the final varnishing. After all that hard work, the students can sit back and relax: The bench has a prominent display spot in the school’s main lobby, near a display of photographs taken by all of the CFES students as part of the annual “Art in Action” program. This bench is fantastic. Great project for a “leave behind”. Every school should have one!